What's left from when I was young. I have been a NYC explorer since boyhood; I used to make my parents or grandmother take me on bus rides all over Brooklyn in the early to mid-'60s, all the local lines in Bay Ridge, the B16 down Fort Hamilton Parkway and 13th Avenue; the B37, on 3rd Avenue, and the B63, on 5th, bound for what we called “downtown”; the B64, on 86th Street and Bath Avenue to Coney Island; and if we really went far afield, the B35 on Church Avenue in Flatbush. My mother was reluctant to do that one to the end of the line, since it ended its run in Brownsville, a tough area then as now. When I turned 9 or 10, it was time to start to be a little more independent and I acquired a bicycle and started to rove all over Brooklyn, expanding my reach a little bit every year; by college I was routinely reaching as far as Valley Stream and Elmont. When I was still small, though, my elders repeatedly warned me about Sunset Park. Don’t go there, they said, because “that’s where the bad boys are.” For many years, therefore, my only glimpses of this community that bordered my own, Bay Ridge, was what I could see out bus windows on the B63 (5th Avenue) and the B70 (8th Avenue). 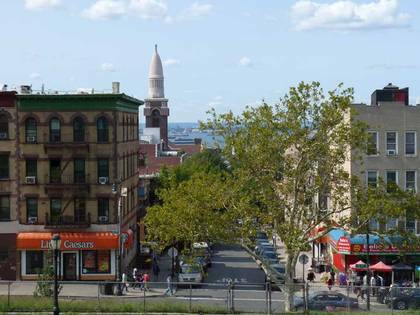 In reality, in those days and well into the 1980s, Sunset Park was a prime location for gang activities and earned its “bad boys” name deservedly. Let's take a look at some key sites in this place that bordered my neighborhood but was so much different. This Romanseque Revival building with a corner turret at 4th Avenue and 43rd Street was an early addition to the Sunset Park scene. 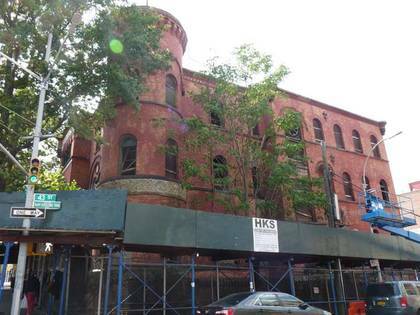 The castle-like structure, which includes stables, was designed by Emile M. Gruwe and completed in 1886, even predating Sunset Park itself and the Bush Terminal buildings along the waterfront, which began to appear in 1890. After Brooklyn was annexed to NYC in 1898 this building became an NYPD precinct and went from the 18th to 43rd to 143rd to finally the 68th Precinct. 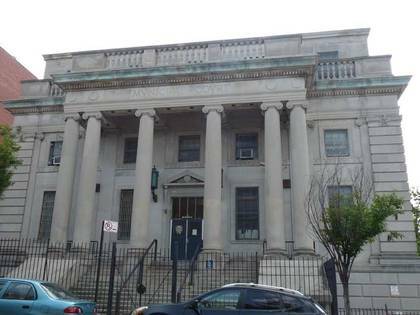 Gruwe also designed the nearly identical 75th Precinct building, also in disrepair, on Liberty and Miller Avenues in East New York. The building has been vacant for several decades, since the 68th merged with another precinct and moved into a new building further north on 4th Avenue and 29th Street. There have been plans to convert the old 68th to a school for decades—a 1986 sign touting one such project can still be seen on the fence outside the entrance—but none seem to have gained traction. Another plan was floated in 2016 that would see the exterior walls survive but a completely new school building constructed within it. A relatively recent addition from 1931 (Mortimer D. Metcalfe, architect), the Sunset Park Magistrates Court was one of four regional courthouses that handled local cases before courts were centralized on Brooklyn’s Legal Row on Cadman Plaza West in 1962. Defendants processed in the 68th were arraigned here. Grand, Ionic-columned entrances appear on both the 42nd and 43rd Street sides. After the court moved out in 1962 the building was used for decades as offices by Community Board 7 and later as a police training venue. After several years of disrepair, it was renovated in 1996. The incredibly tall, 200-foot high campanile of St. Michael’s Church—a parish founded in 1870; the current church, designed by Raymond Almirall, was dedicated in 1905. That year, it was the tallest building in Brooklyn and was later succeeded by the Williamsburg Bank tower now called One Hanson in 1928 (which itself has been succeeded a couple of times since). Almirall designed a similar, but much shorter, structure in Queens’ Calvary Cemetery in 1895, the cemetery chapel. With their “beehive” towers that could also be thought of as resembling bishops’ mitres, both buildings resemble the Cathedral of the Sacred Heart in Paris. 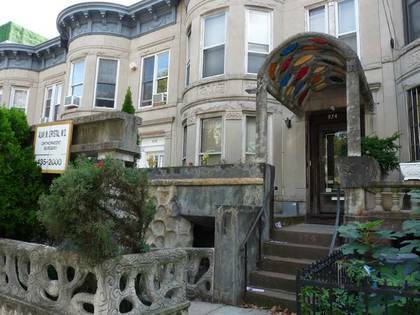 The Calvary chapel also served as a burial crypt for NYC’s parish priests. 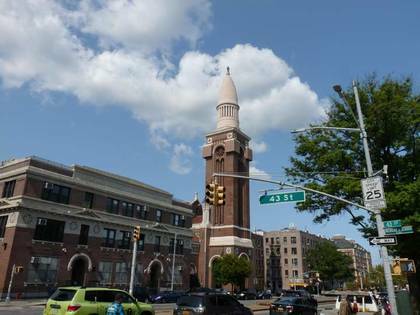 The St. Michael’s campanile can be seen from all over Sunset Park and can even be made out from as far away as Park Slope, but climbing a pair of staircases at 5th Avenue and 43rd Street into Sunset Park itself sets it off and gives it a contextual view; compare a parochial view of the neighborhood, with St. Michael’s as the local castle, to the far-off views of both New Jersey and the Manhattan skyline that get more impressive the higher you go, for as impressive as the view is from the top of the steps, you can also ascend yet another level to the top of the hill the park is situated on and get the full panoply. It’s not Brooklyn’s highest promontory—that honor goes to a peak in Greenwood Cemetery—but Sunset Park, between 5th and 7th Avenues and 41st and 44th Streets, comes close, and it was named for the occasionally spectacular sunsets that can be seen from here. On those rare perfectly clear days, New Jersey’s Watchung Mountains, the only real mountains visible from NYC, also come into view. Sunset Park itself was founded in the late 1890s. It once had a pond used for fishing in the warm months and ice skating in cold months (NYC once had a climate that featured extended cold periods enabling outdoor ice skating). Streets were mapped in the area before the park was constructed, but they were paper streets only, reflecting what city planners had determined to run through there. The pond, which had been created when the park was originally built, was eliminated when the Sunset Park swimming pool was built in 1936. Sadly, the carousel and six-hole golf course that used to be here are long gone. Located at 7th Avenue between 42nd and 43rd Streets, the Art Deco Sunset Park Pool administration building looks much the same as it did when it opened, with Art Deco elements preserved from its opening in 1936 as part of Works Progress Administration project that built 11 public pools divided among NYC’s five boroughs; Astoria Park’s was the largest, and even hosted Olympic team swimming trials for the 1936 games. The pool itself is behind the building; it and its attendant playgrounds received an upgrade in 1984 with new play equipment. A look in the lobby reveals photographic murals of the pool in its early days, as well as photographs of several colonial Dutch-era homes that survived until the park’s opening. None of those homes survive today, though other Dutch homesteads can be found in other Brooklyn neighborhoods. In just 20 years, I’ve watched the stretch along 8th Avenue become one of NYC’s many Chinatowns (along with the ones in Manhattan, Bensonhurst, and Flushing); the area nearest the water has a distinctly Latin, now primarily Mexican, flavor. But 30 to 40 years ago, Sunset Park and its neighbor to the south, Bay Ridge, boasted a considerable Scandinavian population, primarily Norwegian (Nordisk Tidende was to be found on most newsstands, and a number of Danish bakeries lined Fifth Avenue). The Scandinavian legacy is being preserved by the annual Norwegian Independence Day Parade in May, the recently renamed Lutheran Medical Center on 2nd Avenue and 54th Street (founded in 1883 by a Norwegian Lutheran nurse, Sister Elizabeth Fedde), and a few other locations such as the Danish Athletic Club on 65th Street and Gjøa Sporting Club around the block on 64th, near 8th Avenue. The area around the northwest end of the park, however, was an enclave of immigrants from Finland who found work on the waterfront. The Finns have a culture that is somewhat apart from the Danes, Norwegians, and Swedes; their language, for one, comes from a separate family of languages and is quite different from others spoken in Scandinavian countries. Soon after arriving in Sunset Park, Finns developed co-operative housing in buildings that resembled apartment houses. Though they are now divided into rental units, their old names, such as Sun Garden Home Association and Sunset Court Association, are still marked on the buildings. 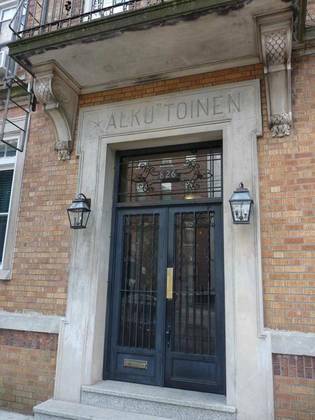 Notably, one such co-op at #826 43rd Street is marked “Alku Toinen” above the entrance, Finnish for “Second Beginning.” The “First Beginning” building at #816 formerly had stenciled lettering, “1 Alku,” on the entrance transom that has since been removed. 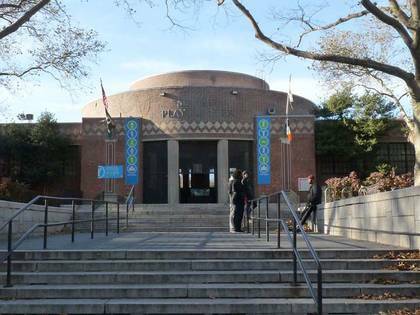 Finally, a Sunset Park mystery, on the border of Borough Park and a couple of blocks away from Maimonides Hospital, where it all began for me 60 years ago. For as long as I can remember, the exterior of #947 52nd Street, near Fort Hamilton Parkway, which is home to the offices of Dr. Alan Crystal, orthopedic surgeon, has had an unusual design and canopy, with molded and plastic surfaces setting it apart from the other attached houses on the block. I imagine calling his office might be one way to ascertain the reason for it, but so far, I’ve been a little hesitant to do so.